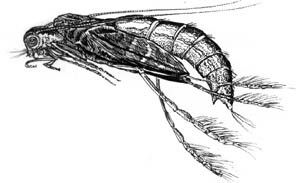 Caddisflies are also known as sedges. Unlike the dragons and damsels, sedges have complete metamorphosis with larval, pupal and adult stages. Larvae: Larval cases are built from surrounding material, such as sand, small stones, tiny twigs or bits of vegetation. Larvae go through several molts and build a new home to accommodate each successively larger stage. The larval stage can last from one to two years. Coloration is extremely varied, but green and yellow are important. Sizes range is from one-half to four cm. Pupae: Once the final molt is complete, the larvae seal themselves in their homes and undergo the transformation to the pupal stage. Pupae cut their way out of the cases and swim slowly to the surface. Fully formed adults emerge from the split pupal shuck and rest while the wings dry. To get airborne, they scamper across the surface forming a trailing vee across the water. Color and size range is as for larvae. Adults: After mating, females return to the water to deposit their eggs by lowering their abdomens into the water. Usually the females remain in constant motion while laying their eggs. Tan is the most important color as this is the typical wing coloration. Body color is varied, but green -- everything from forest green to bright emerald -- and yellow are important. Adults are easily recognizable by their moth-like appearance and by the way they carry their wings when at rest, like a traditional A-frame style tent. Large moth-like creatures scampering across the water's surface are caddisflies. Larvae are identified by their cases. Pupae of the types most important to interior waters have a long, dangling set of legs used as oars during the surface swim. This and their even longer antennae, laid back across the body, identify them. Many details are provided above, but note that when pupae emerge from the larval cases, they are sheathed in a membrane with only their oar-like legs protruding to help them swim. Hatching most often occurs as soon as the surface is reached; the membrane splits down the back and the adult heaves itself free. This may take some time. Adults wing their way to shoreside vegetation to rest. Mating normally follows some weeks later and is most often done in the air. Females of some species enter the water and lay their eggs on the bottom, others drop them while flying over and still others by lowering their abdomens into the water. Again, emergence is a function of elevation and weather, but the last two weeks of June and into early July are typical peak emergence times. They can continue through to September. Late morning to midafternoon seem to be the peak hours for emergence, but late-night hatches are a sedge hallmark. Any sign of sedges on the surface calls for either adult or pupal imitations, especially if the naturals are large. Emergence times on individual lakes vary little from year to year; diaries are the way to keep track. Kamloops trout noisily ripping large caddisflies flies from the surface of a Thompson-Nicola lake makes for an angling experience hard to top anywhere in the world. 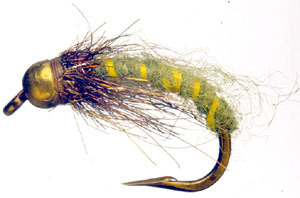 Deerhair flies and drylines are used, but for all that has been said and written about dry-fly fishing and the sedge, it is often pupal imitations which take the most fish; the trout will key to them while ignoring the large adults veeing the surface. Pupal imitations can be fished just subsurface with dry lines or from top to bottom with appropriate lines. Best bottom to top retrieve consists of a series of short twitchy pulls followed by a pause, then a fairly long pull, pause and twitch again. Body color of adults can be vital, especially once the hatch has developed to the stage where the fish are well-fed and fussy. 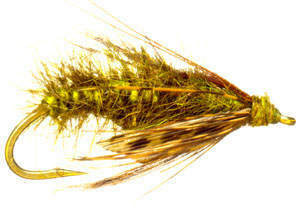 Remember fish look up from below at the sedge and body color is the first thing they see. Pupae struggle mightily to free themselves from their shucks; trout often key very specifically on this stage, a good thing to remember when fishing the adult amidst splashy rises with no results. Even if no diary is kept, record the time, date and location of any strong sedge hatch encountered. Next year's hatch will be a repeat almost to the minute, provided that similar weather conditions prevail.